We Aussies have taken to blenders like blenders take to chopping up a banana. It’s a natural synergy, and in our busy lifestyles a blender seems like a perfect solution for those always on the move. This is where the Nutri Ninja brand steps in to blow your socks off. No longer are blenders boring and clunky. With the likes of Nutri Ninja, blending foods has never been so exciting. You can blend all your superfoods – quinoa, chia seeds, avocado and so on – into healthy, tasty concoctions in such an easy fashion. It’s hard to imagine life before full blown blender warfare. So, what does the Nutri Ninja range offer consumers, and how does it compare to other brands? You’ll never be left yearning for more smoothies while on the move. With this model, you have enough capacity to see you through the day. From the compact models to the gargantuan, there’s like to be a Nutri Ninja out there for everyone. Is a Nutri Ninja worth the money? There seems to be a case of ‘keeping up with the Joneses’ even in the blender world. The truth is, you might not need one that can melt your face off with the press of a button or chew through wood faster than a colony of beavers. It’s all about what you need and how a blender can accommodate that. If you have a small family or you’re just after a morning smoothie for yourself, then a Nutri Ninja in the lower end of the price range may be suitable – they are great value. However, if you’re a larger family, or use your blender for everything under the sun, then one with a larger motor could be a good idea. Nutri Ninja have a wide range at a variety of price points, so there could be one out there that suits you perfectly. Nutri Ninja vs NutriBullet: How do they compare? It’s a debate that continues to range: Nutri Ninja or NutriBullet. They’re two power houses in the blender world that both shot to fame in the television infomercial market, and then later became available in department stores. They both have catchy names, so where do the similarities end? Let’s compare prices of the NutriBullet to our trusty Nutri Ninjas with The Good Guys. 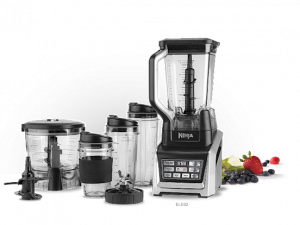 In Australia, NutriBullet offers eight models while Nutri Ninja currently offers six. We’ve only listed models from each brand that have similar blending power. As you look through the list, it’s Nutri Bullet that seems to offer a better price for the power level offered. If you’re after a top-of-the-range model for intense blending, then the NutriBullet offers a more powerful model for the same price as the Nutri Ninja Complete ($349 RRP). NutriBullet and Nutri Ninja are pretty even at the high-end, but at the low end, Nutri Ninja wins out. 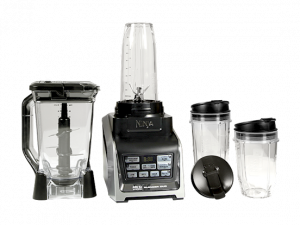 Overall, they’re two giant blender brands and for good reason – so it’s up to you and your individual needs as to which blender is right for you. What do customers think about Nutri-Ninja Blenders? In 2018, Australian customers gave Nutri-Ninja 5 out of 5 stars for overall customer satisfaction for blenders.